Former Black Stars midfielder, Sulley Muntari, has been training alone at his new club Albacete as he gets ready for his appearance for the team. Muntari joined the Spanish second tier club on January 31 as a free agent until the end of the season but he has still not played due to possibly reasons of fitness and a lack of sharpness. 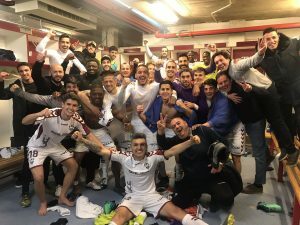 Although Muntari is yet to play for the team, he has been part of activities at the club including celebrating their 2-0 victory over Mallorca on Sunday, February 10. A picture taken in the dressing room after the match has Muntari with the rest of the team enjoying the result. Muntari will hope to be part of the team when they travel to Real Zaragoza for a league game on Saturday.